In wake of Hurricane Sandy, president of the United States pulls off a little 11th-hour diplomacy. 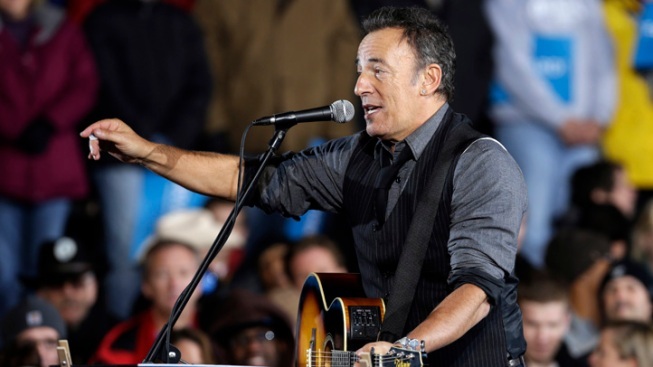 Singer Bruce Springsteen performs prior to President Barack Obama taking the stage at his final campaign stop on the evening before the 2012 election in Des Moines, Iowa. New Jersey Gov. Chris Christie has another reason to sing the president's praises. Barack Obama, having won major props from the Republican governor for his response to Hurricane Sandy, built a bridge that Christie had probably lost hope of ever crossing--the bridge to the Boss. And we don't mean Michelle Obama! Instead, Obama was having a phone conversation with Christie while aboard Air Force One when he asked the governor if he had time to talk to somebody who was flying the friendly skies with him. "In times of real difficulty, he thought the only thing better than one Jersey guy was two Jersey guys, and he put Bruce Springsteen on the phone," Christie, an avowed Springsteen fan who never had occasion to meet the long-time Democrat due to their political differences, told reporters at a press conference today. "Bruce said to me how proud he was of his state," Christie said. "How proud he was and how tough we are. It was a good conversation today, and it was great to talk to the president--and even better to talk to Bruce." Hmmm, we wonder if Christie has been too busy to cast an early ballot. Mitt Romney might want to give him a call, you know, to see where he's at. But though Christie obviously just had a glory day, Springsteen, a longtime Obama supporter, wasn't quite as quick to gush about the experience. The Rock and Roll Hall of Famer did retweet this sentiment from ABC News' Jake Tapper, however: "By bringing together @Springsteen and @GovChristie, perhaps the president's Nobel now makes a bit more sense, amirite?" So, he's at least acknowledging that it happened. And Springsteen did have quite the event to get ready for. Less than 24 hours before the polls open, he and Jay-Z shared the stage with Obama at Columbus' Nationwide Arena. Springsteen strummed out acoustic versions of "No Surrender," "The Promised Land," "Obama" (aka "Forward") and "Land of Hope and Dreams." Obama vs. Romney: Who's winning the celeb endorsement battle?